Are you looking for the best yoga mat for hot yoga? Most yogi have not practiced hot yoga, so if you take their recommendations, you may be sorely disappointed. We will help you choose the best non slip mat for hot yoga that actually works. There are generally two approaches that mat manufacturer’s use to improve grip for hot yoga. The first is to use a thin upper microfiber layer bonded to the lower foam mat. This is similar to combining a yoga towel with a yoga mat, which works quite well for hot yoga. The idea is that the upper microfiber absorbs sweat, prevents pools, and increases grip under wet conditions. However, these “combo” towel-yoga designs have a crucial difference from a yoga towel laying on top of the mat. To keep the mat reasonably thin, the combo towel-yoga designs have a much thinner absorbing upper layer than a regular yoga towel. This means that the microfiber material can absorb much less sweat before it becomes saturated. Disappointingly, many of these yoga mat designs do not hold up under strenuous hot yoga conditions. They DO work quite well for normal conditions or for people who just have extra sweaty hands. The Combo Yoga Mat (click for our review), falls under this category. It is a solid mat with a neat two-surface feature, but it can start slipping under very wet conditions. 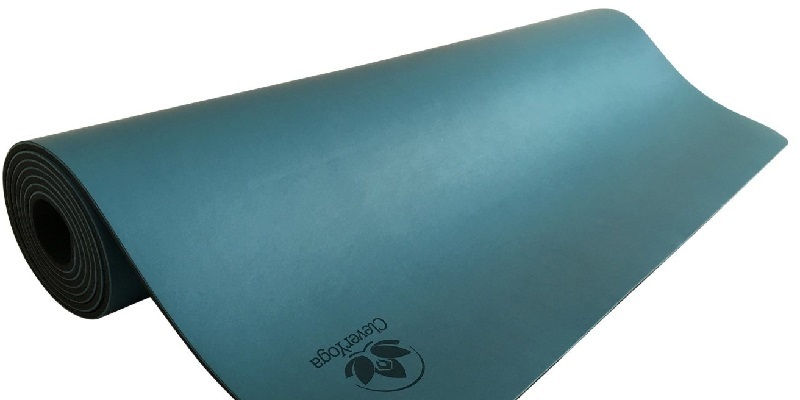 Other sites often recommend the Gaiam Sol Studio Select Dry-Grip Yoga Mat as well for hot yoga. You can go to Amazon and read the negative reviews from people who actually practice hot yoga. Also, you should note that many microfiber surfaces are actually MORE slippery under normal yoga conditions when not wet. The smooth microfiber surface can have very little grip until wet from your perspiration or from a quick spray using your water bottle. If you really want to use an absorbent microfiber yoga mat for hot yoga, we recommend getting a dedicated yoga towel. That’s exactly what yoga towels are for. A decent yoga towel and yoga mat will out perform and cost less than many mediocre hot yoga mats. Read our yoga towel review for recommendations on which towel to buy. Instead of absorbing sweat, the other approach used by hot yoga mats is to generate a very sticky surface on a non-absorbing surface. It doesn’t matter if the surface is wet or not if the underlying material remains sticky against your hands and feet. We prefer this approach for hygienic and maintenance. Non-absorbent materials will not take up sweat and breed harmful bacteria. The mat will not smell and will not put you at risk for athlete’s foot or other rashes. Microbes growing in absorbent mats can also accelerate mat breakdown, reducing durability. Cleaning and caring for a non-absorbent closed-cell foam mat, though, is quite easy. You just have to wipe the surface with a disinfect or spray. Microfiber coated mats, on the other hand, require more thorough soaking and washing. The problem, though, is that it is difficult to create a sticky surface that actually maintains its grip under very sweaty conditions. Let’s be clear: you will have to buy a premium yoga mat at premium prices to have this level of stickiness. The best yoga towel combined with a cheap yoga mat will cost the same or less, and likely perform better than most premium mats for hot yoga. However, you have the inconvenience of having to carry around two items, and as mentioned before, the hassle of cleaning the absorbent layer. There’s only really one yoga mat on the market that works under all sweat conditions. That is the Clever Yoga LiquidBalance (reviewed here). Every company has a different secret recipe. Clever Yoga’s polyurethane upper layer coating maintains a very sticky grip even during hot yoga. If you really are generating literal pools of sweat, you may have to push the puddles off the mat with a small hand towel. However, the LiquidBalance by all accounts is superior to other premium mats, including the Manduka PRO, Jade Harmony, and others. The LiquidBalance is the stickiest and best yoga mat for hot yoga. If you must have the absolute best yoga mat for hot yoga, go for the Clever Yoga LiquidBalance mentioned previously. Other options are likely to disappoint you. If budget is a concern, we recommend you get a budget level yoga towel and budget level yoga mat. They will outperform other much more expensive options. If you want to shell out for brand names, you could get the Manduka PRO combined with a Yogitoes Hot Yoga Towel. That would set you back $150-$200 (yikes) but you would certainly get the best of everything. If you have to choose between a cheap towel and expensive mat, or expensive towel and cheap mat, go for the more expensive towel paired with the cheaper mat. The towel is what will determine if you slip or not during hot yoga as long as you have a decent yoga mat. Read our yoga towel and yoga mat guides for help in choosing budget or high-end towels and mats.